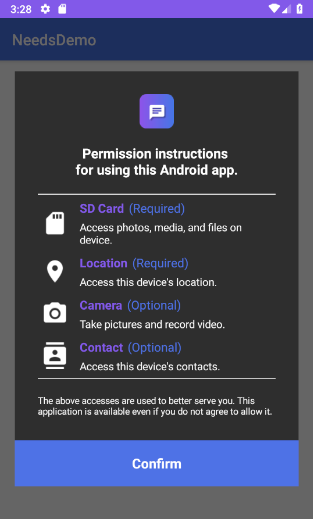 An easy way to implement modern permission instructions popup. Needs can be fully customized and showing with animations. And add a dependency code to your module‘s build.gradle file. This is a basic example on a screenshot. Here is how to create Needs using Needs.Builder. This is how to create Needs‘s instance using kotlin dsl. 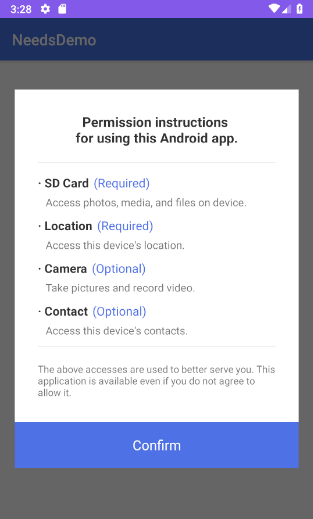 title = "Permission instructions \nfor using this Android app." description = "The above accesses are used to better serve you." We can listen to the confirm button is clicked using OnConfirmListener. Here is how to show needs popup and dismiss easily. needs.show(layout); // shows the popup menu to the center. needs.dismiss(); // dismiss the popup menu. needs.show(layout); // shows the popup menu to the center. needs.dismiss(); // dismiss the popup menu. TextFrom is an attribute class that has some attributes about TextView for customizing popup texts. Here is how to create TextForm using kotlin dsl. NeedsTheme is an attribute class for changing Needs popup theme easily. Here is how to create NeedsTheme using kotlin dsl. NeedsTheme is an attribute class for changing Needs popup RecyclerView’s item theme easily. Here is how to create NeedsItemTheme using kotlin dsl. NeedsAnimation implements showing and dismissing popup with animations. If you want to show-up the Popup only once or a specific number of times, here is how to implement it simply. .setPreferenceName("MyNeeds") // sets preference name of the Needs. .setShowTime(3) // show-up three of times the popup. the default value is 1 If the preference name is set. .setPreferenceName("MyNeeds") // sets preference name of the Needs. .setShowTime(3) // show-up three of times the popup. the default value is 1 If the preference name is set. Dialog, PopupWindow and etc.. have memory leak issue if not dismissed before activity or fragment are destroyed. But Lifecycles are now integrated with the Support Library since Architecture Components 1.0 Stable released. So we can solve the memory leak issue so easily. Just use setLifecycleOwner method. Then dismiss method will be called automatically before activity or fragment would be destroyed. :closed_umbrella: An easy way to implement modern permission instructions popup.